For those extremely cold days where your toes can't seem to stay warm. This insulating Tip Toe Cover insulates maximum heat to keep your toes warm. The toe sock consists of a 3mm neoprene insulation and is worn under or over your high performance socks. Keeping your toes warm is essential for all outdoor winter sports. 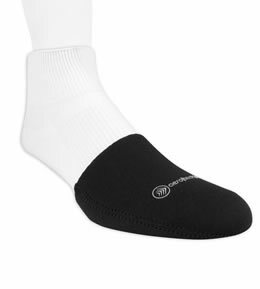 Toe Sock is 3 mm neoprene toe insulation is worn under or over your high performance socks. These toe warmers are a great idea and the work great without creating bulk. If you don't want to go through the pain of putting warmers over your shoes and cleats. This is the way to go. Plus they help to you toes dry. My running shoes have mesh on the toes. Too cold with that ventilation for Wisconsin winter running. These 'winterized' my shoes really nicely! I'm a fan! They help alot...who knew. I wish they were a little bigger to fit my size 13 wide body foot but... I don't leave home without them. Winter in Maine is long and more often than not, very, very cold. I have been using these toe warmers now every day since I purchased them and have found them very satisfactory. Not just because they help keep my toes warm, but because they can be used over and over again. They are not bulky at all which I find most helpful when putting on my footwear. For the price, I would recommend them highly for anyone wanting to keep their toes protected from the cold. As a power-walker who has to contend with the "joys" of a Canadian winter, the toe warmers have made a big difference to my enjoyment. Simple solution seems to do what it's supposed to do. I'm not a high-tech cyclist so my cycling shoes are an old pair of street shoes (Clark's Sphinx) and it's hard to get shoe covers to fit them -- especially with my relatively wide foot. I've been using 2 pairs of socks and with just those, I'm good for 35 or 40 minutes when the temperatures are below freezing. So far I've only used these once when the temperature was -5C. I put them on over the 2nd pair of socks. After riding an hour or so, my toes felt relatively normal. Great for colder rides. Very happy with quality and price! My toes have been cold since I moved to Chicago and I lucked out and found these. I wear them over my toes at home and not a chill to be had. Love them. Bought these to help extend my biking season using my Keen cycling sandals. With the right socks, I'm good down to about 45 degrees or so. I'd want something that covers my whole foot much below that. I'm surprised how much I'm still using these now that it has warmed up a bit here. They provide a little extra cushioning for my toes, helping prevent some numbness I was experiencing without the covers. Kept toes warm at 0degC. I told my wife that I wanted something like this and then I saw these and it is perfect. I rode 2 hours last night average temperature was 35F feet were comfortable. First time, I used them they felt weird but I loosened my shoes and much more comfortable now. I wear these under my heavy socks in my road shoes; they help keep the feet warm (I've used 'em down to about 40Â°F/4Â°C). My feet are cold to start, but with these, they warm up much more quickly than without. For sub-freezing temps, you'll probably want a winter shoe or a full cover (road shoes ARE ventilated for those hot, summer days). These work for me. Not much different from the Gator version, which are minimally more expensive. Toasty toes are happy toes! These ATD toe warmers turned my very ventilated cycling shoes into more comfortable cold weather accessories.|Haven't tried it yet but I'm thinking these toe warmers might just work well inside my snow boots. The way it's looking I might be using them a lot for that this winter here in Michigan! I bought these as gifts JUST because of the weather! They went to a delivery route driver and a shipyard worker. I had similar toe toppers while working outside with steel toe work boots and loved them. Both recipients commented on how great these toe toppers warmed toes. Gives your feet just a little added warmth on cool weather days. For me, I consider these useful for temperature ranges of about 45 - 60 degrees. You're going to need something more substantial if it's colder than that. They seem to be well made. I like them and would purchase again. Works as well as you would think a thin layer of neoprene would to keep your toes warm. Better than nothing but my toes are still freezing by the end of my rides. Great for cooler weather where shoe covers are too much. Keeps toes warm. Running in cold temperatures make my big toes hurt wearing standard cotton socks (even two pair). I have used ATD toe warmers twice at 35F and 26F and they kept my toes from aching. When I first put them in my running shoe I can hear a dry squeak.